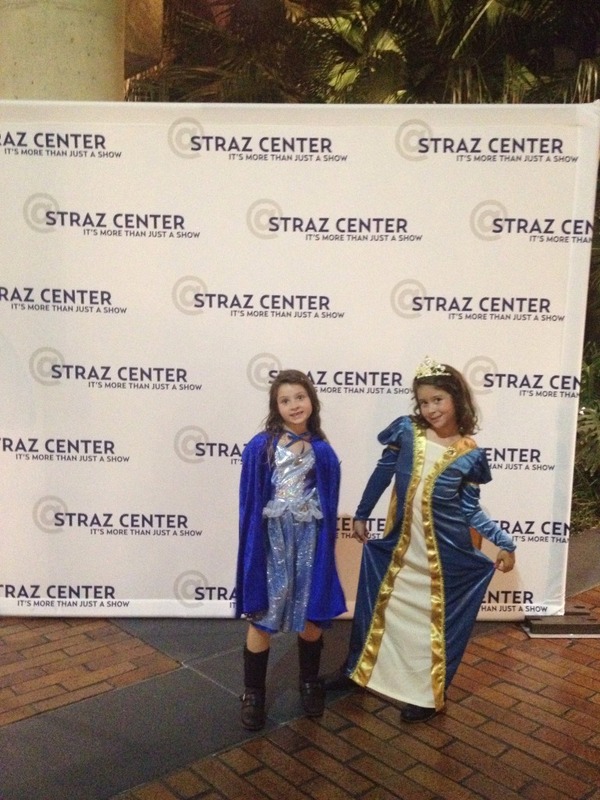 Last night I had the opportunity to see Cinderella at the Straz Center in Tampa. I received 3 tickets for the show through the Tampa Bay Bloggers. It was a long night, especially for a 6 and a 7 year old, but what they experienced will last forever. There’s just something special about opening night. And this being Cinderella I couldn’t pass it up. The night started with a trip to Walmart for a “Cinderella-esque” dress for one of my daughters. Now that we had the “proper” attire for the ball, I mean the show, it was time to hit the road! 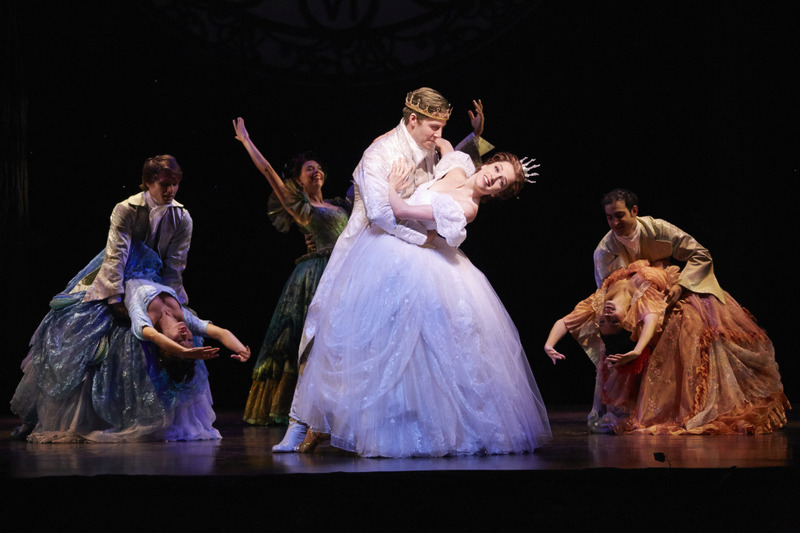 Cinderella is playing at the Straz Center through October 26. Performances are Wednesday – Thursday at 7:30 p.m., Friday at 8 p.m., Saturday at 2 and 8 p.m. and Sunday at 2 and 7:30 p.m. Regularly priced tickets are $56-$95 and may be purchased by calling 813.229.STAR (7827) or 800.955.1045 outside Tampa Bay, in person at the Straz Center Ticket Office or online at the Straz Center. Handling fees will apply. The show was wonderful. But how can it not be, we all remember reading Cinderella growing up. I know I did. And those magical glass slippers, how can I girl forget. For me, it was always about that carriage. Being carried away to a ball in a magnificent carriage. This past May we attended my sister’s wedding. The one thing, she wouldn’t budge about was having a horse and carriage at her wedding. I think most of us want that magic in our lives, even if its just one day. If you are wondering if you should take your kids, I would say yes! My two girls thoroughly enjoyed the show. They even laughed at the right spots. Towards the end of the show, when the prince kissed Cinderella’s hand, my youngest daughter loudly said Ewww! during last night’s performance. I’ll never forget that moment. Thankfully, the whole audience bursted out in laughter. And I couldn’t stop laughing. The play went on and there were no more outbursts from my kids. However, that single moment will live forever in my mind. The moment my daughter became part of the Cinderella production. The Straz Center, Belle of the Ball Project and the company of Rodgers + Hammerstein’s Cinderella are pleased to announce that through Sunday, Oct. 26, donations of formal gowns, shoes and accessories will be accepted at the Straz Center during the performances of the Tony-award winning production. The partnership benefits Belle of the Ball Project, a nonprofit organization that provides homecoming and prom dresses to young women in need. We heard the ewww and laughed! We must have been sitting right near you. I wish I had met you. I think the front of the audience was wondering what the laughter in the back was about… there even seemed to be a pause on stage. What did you think of those quick changes!! What a fun show and a great girls night. Oh my gosh, my heart stopped! No joke. I really didn’t know how people were going to react. I’m so glad everyone laughed! I was panicking for sure. Yes, I thought there was a pause on stage, but I couldn’t tell if it was just me feeling like time had stopped! I couldn’t believe how quickly Cinderella was able to switch from one outfit to another. Truly an experience! Thank you! I can’t believe how fast Cinderella switch in and out of outfits! The show was amazing. I’m so glad they had a blast – how cute are they?! They sure did! And so did I. Thanks! Cinderella has always been one of my favorite story’s. When I was little it would come on TV once a year and we were always parked in front of the TV to see it! The girls are adorable in their “Cinderella-esque” costumes! It is always fun to attend a live play! Thank you! As a child I attended many live plays and I want my kids to have that experience too. Looks like so much fun! I love Cinderella, by far my favorite Disney story! I’m so jealous! I love Cinderella and would love to see it live. I love how adorable your girls look all dressed up! tiffany khyla recently posted…Best 10 Seconds of My Life (Dallas ComicCon). Thank you! The girls and I had a great time as always. Going to the Straz Center is always fun. Wonderful review! I would love to see this show. When I was little I would watch a live version of Cinderella constantly! I would adore this! BTW your girls are beyond sweet! Kristin @MOMentous Moms recently posted…Cooking with Kids – Taco Night! Oh wow! The costumes are gorgeous! How sweet! This was definitely a night to make precious memories. I didn’t get a chance to go see this show but I love everything Ive seen at the Straz center in the past! It looks like you guys had an amazing time!